Winter storms kill more Canadians than tornadoes, thunderstorms, lightning, floods and hurricanes combined. 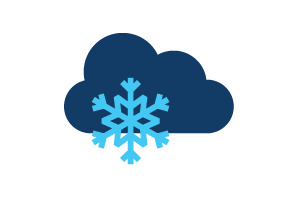 Heavy snowfall and ice can make the roads treacherous and interrupt the power supply. A normal body temperature is approximately 37ºC (99ºF). When your core body temperature drops by 1 or 2ºC (1.8 or 3.6ºF), or your body is exposed to severe cold it increases your risk of harmful effects. Make sure everyone in your family knows what to do before, during and after an emergency. As a family, make a plan and discuss how you can best prepare for the most likely hazards that will affect your home. If you live alone, make a plan for yourself and make sure you talk about it with your friends and neighbours. Keep a list of emergency phone numbers handy and keep a copy in your “Ready to Go” kit (details below). Select a family member or a friend who lives a distance away from you to be the contact person in the event that you get separated from your family. Make sure everyone in the family has this person’s contact information, put a copy in purses, briefcases, school backpacks etc. and make sure it is stored in electronic devices such as iPods, cellphones or laptops. You can also include floor plans that include where exits and escape routes from each room. Don’t forget your pets!! Make sure that you have a Pet Emergency Kit (details below) and have a list of pet friendly hotels, kennels, veterinarians or friends who can take your animal, or who you can stay with if you need to evacuate your home. Make sure you have supplies in your home to be self sufficient for at least 72 hours. You should also prepare a “Ready to Go” kit (below) that has all of the information and supplies that you will need to evacuate quickly, a Pet Emergency Kit (below), and make sure your car has a Car Survival Kit (below) in case you are stranded or need to travel a long distance. Make a list of all of the hazards that may affect you and your home. Contact your local Community Emergency Management Coordinator, Cathie on 613-473-4030, for information on the top local Hazards in your community. Find out how you can prevent, mitigate or prepare for these hazards to ensure that yourself, your family and your pets can remain safe and calm during an emergency.